For a brief window of time during the Men’s Championship Singles on Saturday it seemed that course record holder and 2014 champion Andrew Campbell had bested the field of domestic and international elites and taken home first. But then University of Washington senior Ben Davison came from the 26th start position to steal the show and a win in a time of 17:55. 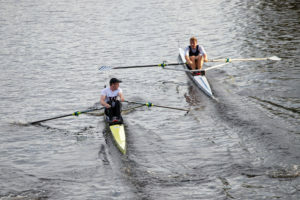 This was Davison’s fourth race at the Head of the Charles and his first time rowing singles. A winner two years ago as a member of the Washington eight, he came in an underdog in the singles race, but held his own out on the rough water. “It was definitely a little unexpected,” he said about his win. “There were a lot of big names in there today so I’m just really ecstatic about it.” But while Davison was definitely an underdog, he was hardly an unknown. Together with John Graves, he was in the U.S. double at last month’s World Championships in Bulgaria. Davison is a big fan of the Head of the Charles event and said he loves traveling out here and tries hard to make his school’s boat every year. His switch to racing singles came from his coach Michael Callahan’s push for him to do whatever made him the most excited. For Davison, that meant the chance to break into the singles race while still representing his school. Davison’s family came up from Florida to see him race in the Head of the Charles before, and according to Davison, were “blown away” by the event and said the atmosphere and the crowds were unlike anything they had ever seen. Looking ahead, Davison is excited for his senior year and looking forward to rowing his final collegiate season next spring. That being said, the 2020 Tokyo Olympics are also in the back of his mind. “I am ultimately planning for doubles at the Olympics, but for now I’m excited to go back to school and compete with the rest of the guys,” he said. Andrew Campbell ended up second with a time of 18:00, Davison’s doubles partner Graves third in 18:11, Kevin Meador in fourth in 18:13, and crowd favorite and reigning Olympic gold medalist Mahé Drysdale fifth in 18:17.